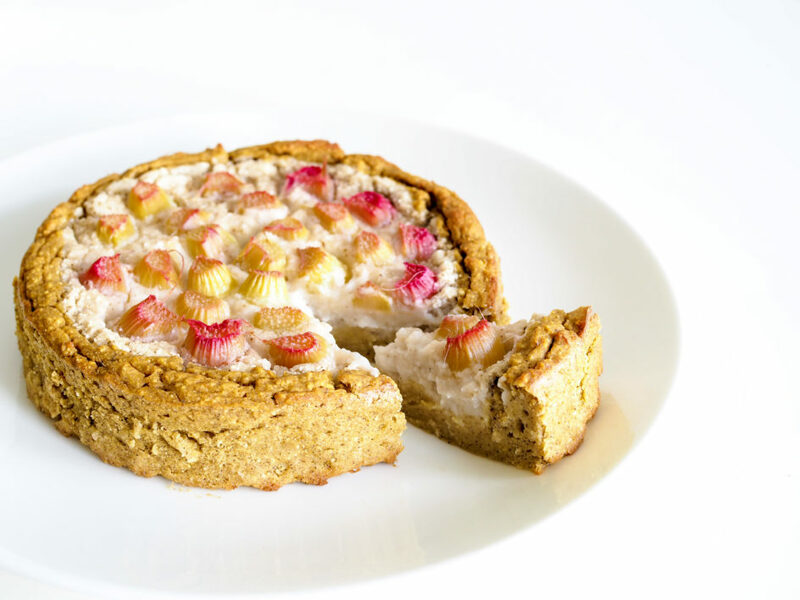 Rhubarb lemon cheesecake - paleo & vegan - NOURISH TO PERFORM. It’s finally rhubarb season again and of course, I had to immediately bake a cake: rhubarb lemon cheesecake! This cake is far from being your regular cheesecake… it is dairy free, grain and gluten free and refined sugar free which makes it paleo and vegan. Enjoyed lukewarm sitting on the balcony in the sun it is pure refreshing soulfood and the perfect way to enjoy some quality time. As most of my recipes, this is a singel serving cake and perfect if you just need a sweet treat for yourself that takes you only an hour from starting to put together the ingredients to eating it. Mix all ingredients for the tarte and fill into the bottom of the cake tin and up the sides. /Alle Zutaten für den Tarteteig vermengen und in eine Kuchenform geben. Dabei nicht vergessen einen Rand hochzuziehen. Mix all ingredients for the cheesecake filling apart from the rhubarb./Alle Zutaten außer dem Rhabarber für die Käsekuchenfüllung vermengen. 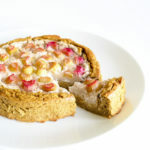 Fill the cheesecake filling into your tarte and top with cut up rhubarb./Die Käsekuchenfüllung in die Tarte füllen und mit geschnittenem Rhabarber verzieren. Bake for about 25 minute until the crust is golden brown. Let cool down completely before removing from the tin./Für etwa 35 Minuten backen bis die Kruste goldbraun ist. Den Kuchen vor dem Entfernen der Form komplett auskühlen lassen.